This evening, 16th of November 2014, will see a new chapter in the story for an amazing song that has already helped millions of people. Bob Geldof and Midge Ure's famous song, Do they know it's Christmas?, has been re-recorded by todays top artists with the aim of raising money for those affected by the terrible Ebola virus diease which has devastated the lives of so many this year. The song has been slightly re-worded to reflect the different cause and there is a new line up. 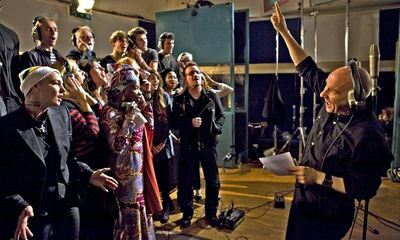 Roger Taylor, Seal, One Direction, Ellie Goulding, Emeli Sandé and Ed Sheeran are just a handful of the musicians included in this version which should appeal to a wide audience. You can tune in to The X-factor UK tonight at 8pm to see the first live performance of the song and can be purchased from Monday 17th November. What concerts/gigs/festivals are you looking forward to this year? What songs remind you of Summertime? Have you ever cried or mourned the loss of a musician? Do you buy band merchandise when you go to a concert? If you were getting married, would you have your pets present at your wedding? What is your favourite flavour popcorn? Do you like brightly painted cars or do you think they are tacky? What is your favourite brand of nail varnish? What's a good song to celebrate the birth of a baby? Do you consider music to be an integral part of your life? What is your favourite Beatles song?